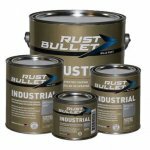 Rust Bullet is a unique single component high solids industrial coating, unparalleled in the coatings industry. 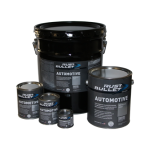 Rust Bullet is an advanced coating, which provides far more than just rust protection. Very different from traditional rust conversion or rust encapsulation products, Rust Bullet's Patented Technologies are the most effective and efficient method available today, to prevent the corrosion of metals. 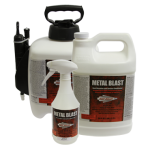 Rust Bullet products protect solid surfaces from oxidation and chemical attack. A cured Rust Bullet Coating provides protection from steel rust, iron rust, metal rust and metals corrosion, and is more effective, an easier application and less costly than epoxy coatings and other corrosion control products. Most rust paints use old technologies to stop rust such as rust conversion with rust inhibiting chemicals added that simply do not work. Rust Bullet's superior technology should not be confused with rust converters, rust paints or other exterior paints. Rust Bullet's distinctive formulation allows the first coat to penetrate the rusted areas dehydrating the rust, causing it to become a compact solid again, which intertwines itself in the resin matrix becoming a permanent part of the coating. The second and subsequent coats of Rust Bullet create an impermeable surface. Unlike other steel coatings or metal coatings, Rust Bullet is a single component coating, which means there is no need for activators or a catalyst. Rust Bullet does not require expensive or time consuming surface preparation, nor does it require special pre-treatment products. 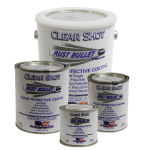 Rust Bullet is designed to apply directly onto rusted or clean surfaces, with brush, roller or spray equipment by the amateur or professional applicator. Once the corrosion detection of metals has been verified, whether by corrosion testing or the evidence of stress corrosion cracking, a corrosion treatment is the next step in the restoration of the substrate. Dependent on the substrate; a stainless steel paint, steel coating, metal coating, or aluminum coating must be applied. Choosing Rust Bullet industrial coatings as the protection paint or protection coating can provide the anti-corrosion warranty that was previously unavailable. Whether your project is for industrial or automotive restoration, industrial or automotive protection, home, farm or marine coating you will find Rust Bullet Products are superior metal protective coatings that will outperform and outlast the old technology of protection paint. 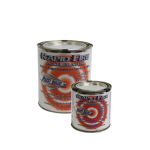 Rust Bullet's superior rust inhibitor and corrosion control coating performed better than most Fire Retardant Coatings in the ASTM E84-04 test for the Surface Burning Characteristics of Building Materials. . Choosing an industrial coating, automotive coating, marine coating, concrete coating, industrial floor coating, home and farm coating, rust inhibitive coating or rust paint is now very easy. With the proper application of a 6 mil dft (dry film thickness) for the majority of typical projects and not less than 12 mil dft for industrial, commercial and marine applications, Rust Bullet is guaranteed to kill the rust and provide rust protection for up to 10 years.